Inspired by lazy summer days, this lightweight shawl features a simple body with an incorporated border that can be easily adapted and made to any size you want. This pattern by Elisabeth Davis De Herraiz available inside issue 104 of Inside Crochet. Not a subscriber? Order a copy online and download a digital edition straight to your smart device. 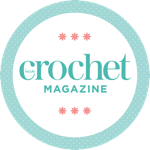 Elisabeth is a crochet addict hoping to pass on her passion and inspire crocheters to pick up their hooks and get lost in the stitches! Find her on Instagram and Ravelry as ElizyArt, and read her blog at www.elizyart.blogspot.com.